The phenomenon of illegal drugs, and their different combinations and mixtures with conflict and violence are a source of insecurity in many places. But illegal drugs are a multi-faceted social issue and a business whose main feature is one: it has a global scope. Just a few elements of this global chain. Small farmers without market alternatives cultivate poppies or coca leaves as a coping and survival strategy, from Asia to the Andean region. 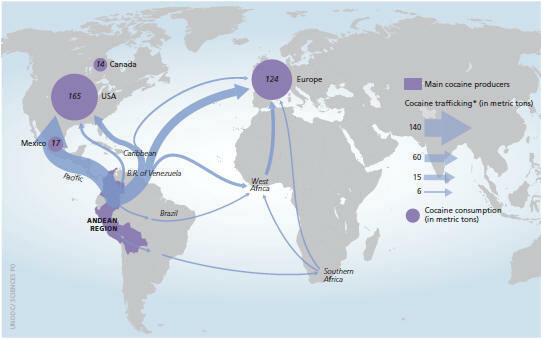 Organized crime groups and networks are responsible for transformation and processing, and take responsibility over the routes and logistic operations that allow putting them in the streets of the most lucrative markets. Along their way, some times drugs finance armed groups. And once in the markets, they can become a public security issue and always a matter of education, prevention and public health. The ‘war on drugs’ has created additional problems. 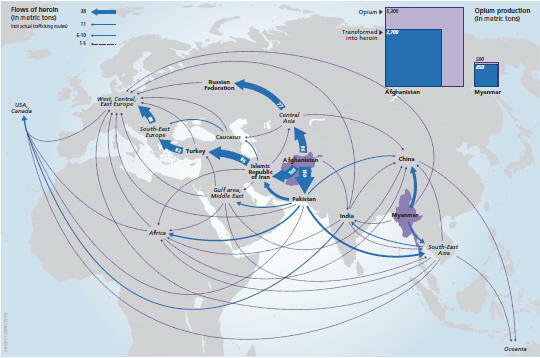 Among their pillars a few can be mentioned: a supply-side militarized approach towards the production and transit countries. This includes forced crop eradication (and voluntary projects, to a lesser extent); police and military deployments to dismantle cartels and close routes. And, in areas like Latin America, extradition of ‘bosses’ to the US. There have been partial successes, but 40 years of war on drugs have not put an end to their global flow. Among the consequences there have been (and are) human rights violations and grave impacts on security and development. This is a simulation about the “Emergent Progressive Era” that we have recently conducted in WIKISTRAT. This scenario explores how a process could develop to put an end to the war on drugs. If you wish to read more, this is a recent article (27th July 2013), published in Spanish by the Institute of Studies in Conflict and Humanitarian Action (IECAH). And here, you can access all the parts of this report. Enjoy! Esta entrada fue publicada en Conflictos, Crimen organizado, English, Narcotráfico y etiquetada cocaíne, drug war, heroíne, Illegal drug trade, Latin America, United Nations Office on Drugs and Crime, United States, WIKISTRAT por Mabel González Bustelo. Guarda enlace permanente.